The Genelec HTS-4B is a powerful low frequency subwoofer designed specially for high quality digital 5.1 channel home theater systems. 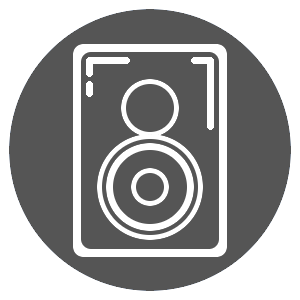 The design layout features one active, magnetically shielded speaker driver mounted on the front side of a compact cabinet and two passive radiators, one on each side of the cabinet. The amplifier unit is integrated into the subwoofer cabinet. Great condition consignment Genelec HTS-4B active home theater subwoofer in black/grey finish. Subwoofer has original box but due to wear, another box may be substituted at our discretion for secure shipping. Sub comes with printed owner's manual. Subwoofer is rated 7/10 for light use and cosmetic wear consistent with age, including some scuffing on unit (see photos).